A 'Teentaal' Sargam' composition and 'Jhala' in Raag Desh. 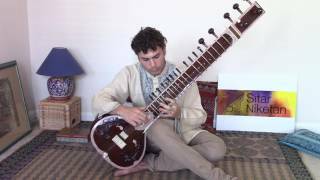 This small presentation symbolizes the philosophy of Sitar Niketan in crossing boundaries and bonding with various textures and tones of music. In this case, the voice and the cello have added to the beauty of a simple piece! Raag Malkauns Teentaal composition. Here Ari has played four and eight beat variations. Alif Laila: solo sitar, at One Circle Center, Silver Spring MD February 4th 2012. Raag Kedar, Alaap/Jor (clips). It is a soulful rendition of the deep feelings of night raga Kedar. The slow unfolding of the mood in Dhrupad ( on eof the oldest form of Indian classical music) i style Alap and Jor brings out the delicate melodic character of the raga. 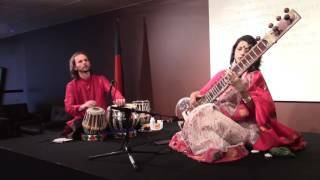 Raag Charukeshi Drut Teentaal composition (fast sixteen beat cycle composition ) Sitar - Alif Laila Tabla - Anubrata Chatterjee Shilpakala Academy , Dhaka , Bangladesh in January, 2015. 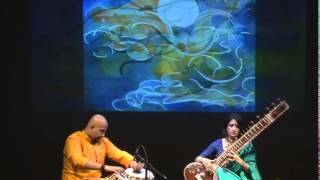 The emotions of the ragas played,were enhanced by Alif's water color paintings during the concert. This interdisciplinary bonding of the arts was a special experience for the audience. 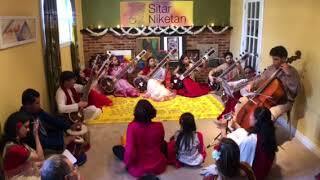 Igniting the resonance of sitar and Indian music, Sitar Niketan is an oasis of culture and learning. Brought to you by acclaimed performer and teacher Alif Laila, offerings range from private lessons to group classes, concert programs and more. Advanced students of Western classical instruments are also welcome for Indian classical music classes and courses. The Washington DC metro area is quickly becoming a hub for Indian arts. Join the celebration!